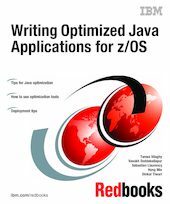 This IBM Redbooks publication is designed to help you write optimized Java applications for z/OS. It addresses different aspects of performance, and discusses architectures, design patterns, coding techniques, deployment, and data access issues. It applies to WebSphere for z/OS Version 4.0.1 for use with the z/OS Operating System Version 1.1and above. Using tips on writing Java-based solutions that have been collected from many different sources, we show how applying many of these tips and measuring performance can help you tune your Java application to perform better on z/OS. We describe how to use the optimization tools Introscope, JInsight, and JProbe, and provide recommendations regarding application architecture and Java coding practices. Ultimately, we illustrate how deploying the application on the z/OS WebSphere platform will provide enhanced workload management and high availability, as well as improved scalability and security.